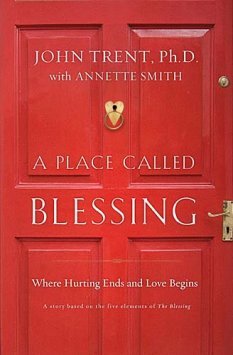 A Place Called Blessing By John Trent with Annette Smith. This is a Religion/Christian/Family type book. I received this book for free Thur a blogger program called booksneeze. First i want to say that i received this book yesterday in the mail and i couldn't put it down. I read it all day, in the car, in bed and in the bath. This is a story about josh who becomes an orphan at the age of four with his two brothers Matt six and Sam seven. They are put into foster care and go Thur a few homes when there is a tragic accident. They are sent to a boys home where the two boys Matt and Sam are adopted and Josh is left. This story follows Josh Thur the struggles of his life. He finds a job and heard about a room for rent that a co workers mom has. He moves in and finally gets to experience what it is like to see a real family. He shares struggles with them and a secret is revealed. His tragedy from his past has been revealed. This story was based on the book the blessing. Which helps to identify the five elements of the biblical blessings to your own life and relationships. This story really touched my heart. I absolutely loved this book and would recommend it to anyone. I will be passing this book on to my mom to read next.